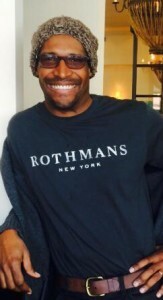 If you know a little about Alvin’s background, you probably know that he was a professional model in the 1980s and 90s, so it’s no surprise that he was asked to be one of four men being featured in the new “Real Rothmans” ad campaign (The oversized posters began appearing on Metro North trains May 1st). 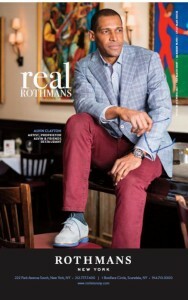 Rothmans Co-President Ken Giddon says the inspiration for the ad campaign was “guys I know who have been shopping at Rothmans for a long time and happen to look good in our clothes.” Top on that list was Clayton: “I’ve known Alvin for years and thought he’d be perfect,” said Giddon. Also featured in the ads are Scarsdale residents Mike Wilson of Wilson & Sons Jewelers and Mike Gerla, a partner with The Atlantic Group, as well as IT specialist Brian Chez of Larchmont. 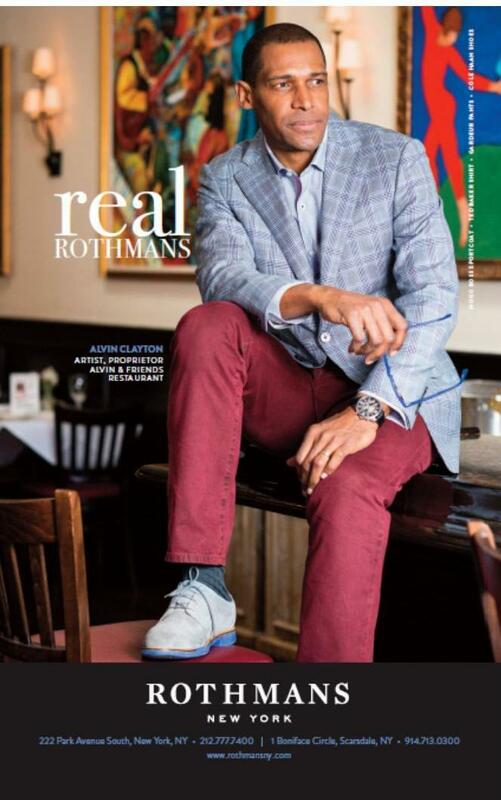 Giddon says he chose local businessmen to highlight other independent businesses: Rothmans, opened in 1926, is a third-generation family business with locations in Manhattan and Scarsdale. Alvin got his start in modeling when a friend in the business suggested he visit the Wilhelmina modeling agency in New York. H e began working catalog jobs, but when Ebony booked him for the premiere issue of its spinoff magazine, Ebony Man, Alvin got the chance to work with top African American models like Beverly Johnson, Iman, Mario Van Peebles and Renauld White. Soon GQ called to book him for a day, and when the magazine’s next issue included eight pages of Clayton – one of the first times a model of color had received such exposure — his career exploded. He soon had a waiting list of clients, including magazines like Vogue, Esquire, Vanity Fair, Self and Glamour and department stores like Bloomingdale’s and Nordstrom, as well as a recurring job for L.L. Bean. It was while working in Paris that Alvin, inspired by the works of Matisse, taught himself to paint. By 1989, Clayton was still modeling, but his career as a painter also began to take off, with a show at a gallery in SoHo where he sold 19 of the 27 pieces featured. He was featured on the TV show House of Style with Elsa Klensch, and soon painting — and then restaurants – became his focus. But even today he continues to book the occasional modeling job, and he is a co-founder of Matrix Model Management, scouting fresh faces for friends in the industry.